JC Realtors is an epitome of the bourgeois comfort par excellence yet at an affordable expense. It not only resonates with the concept of New Age high standard living at an affordable price but also with the human spiritual needs of inner peace, tranquility and sense of well being. 48% of its total land is open spaces with breathtaking scenic beauty, a clean environment and a delightful ambiance which foster a sense of peace & contentment that is hard to find these days. Myriads of leisure time amenities such as a boating area, gyms, spas, swimming pools and various sport centers add to the attractiveness of the City. DTCP approved beautiful venture very near to Bangalore High way. Address: Gokul plots, Vasanth Nagar, Hyderabad, Telangana, India. 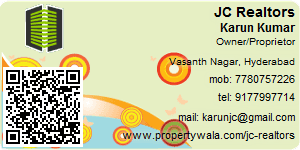 This Broker Profile page for "JC Realtors" has been created by PropertyWala.com. "JC Realtors" is not endorsed by or affiliated with PropertyWala.com. For questions regarding Broker Profiles on PropertyWala.com please contact us.